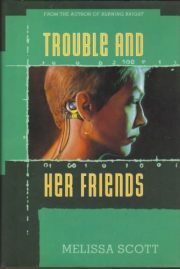 Melissa Scott’s 1994 Lambda-winning cyberpunk novel, Trouble and Her Friends, lives in the intersection of Black-Mask-style mystery and science fiction. It also has echoes of the end of America’s fabled Old West, perhaps in ways that were not intended twenty-two years ago. Convinced that the age of cracking has been ended by the badly thought-out Evans-Tinsdale Bill, Trouble abandons her old online life and her hacker lover, and vanishes into the world of respectability. There she plans to spend the rest of her life living below the law’s radar. Cerise joins the forces of sanctioned anti-cracker security, a Henry Newton Brown of the future. For three years, those plans work. Three years after Evans-Tinsdale has become law, Trouble learns from an old contact that someone has taken up the identity Trouble abandoned, as well as some decidedly illegal activities. The old—the real—Trouble was well known in her community, but she eschewed public notoriety. This new Trouble, whoever they are, takes a very different approach. It is as though they want the authorities to notice that Trouble has returned. Cerise has already encountered the new Trouble. Although she has spent three years working for the Man, the fact that she and Trouble were lovers is no secret. The connection has raised awkward questions. The only way for Trouble to escape prison, and for Trouble and Cerise to enjoy their new, respectable lives, is for the ersatz Trouble to be exposed and arrested. There is not much hope the conventional cops will manage this; they lack not only the skills, but the motivation. As long as there is a Trouble to toss in jail, who cares if it is the right Trouble? Cerise and her estranged lover Trouble do have the right mix of skills… if they can cooperate. These are the books that continue to resonate with readers despite the passage of time. Passage of time? This is a book that is barely a generation old. How much could the passage of time affect it? For one thing, while modern Americans rejoice in the fact that their every online moment is recorded, that any political, social, or religious deviance may at any instant be harshly punished, that their online experiences are carefully crafted to enrich their betters, this was not true back in 1994. Back then, sysops ruled their little fiefs like bloody handed Ivan the Terribles. Governments (despite being responsible for the whole internet thing in the first place) were largely unaware of what was really happening. In the world of this novel, the online world’s self-regulation lasted decades longer than it did in the real world. Its black hats were weeded out by skillful white hat hackers, who feared that to let bad actors run riot would be to invite the oppressive and technically uninformed hand of government. This novel is not the literary equivalent of the 1970s TV show Hec Ramsey, set in the fading days of the Old West. This is more like the fading days of the Old West as imagined by someone writing in the heyday of gunslingers and cattle rustlers, speculating about what might happen if the law ever came to the West. Tim Berners-Lee’s little hypertext project was only four years old when Trouble first saw print. What Scott imagined for the future wasn’t anything like today’s net; she was extrapolating from the world of BBSes. It’s not the world we actually got … but who knows? If Berners-Lee’s little scheme had tanked, perhaps this would be the world we would have now. As far as the cracking scenes go—the advantage of Gibsonesque (gaudily visual VR) interfaces over actual programming is that watching an actual programmer has all the real time drama of watching a potato. [**Editor’s note: I remember telling my ex that I loved the way his forearm muscles rippled when he typed code. So there.] The antics of Scott’s hackers are less cinematic, but you do get the impression that she knew enough about coding and computers to understand that the conventions of cyberpunk were pretty damn silly. Scott’s real focus is not technique, but emotion. Can Cerise and Trouble work together again? Will romantic rapprochement follow a working relationship? I’m not telling. You’ll have to read the book to find out. Trouble and Her Friends is available from Lethe Press.